Subject: GROUPE BANK OF AFRICA (BOA) ABIDJAN - COTE D'IVOIRE WEST AFRICA. GROUPE BANK OF AFRICA (BOA) ABIDJAN - COTE D'IVOIRE WEST AFRICA. TEL:- +225 471 43 494. ATTN:/ MR. ARCHIE G. KANE. WE THE PRIME EXECUTIVE BOARD OF THE DIRECTORS, HEREBY TO INFORM YOU THAT YOU HAVE INTIMEDAITELY LOGIN IN TO OUR MANAGEMENT AS THE RIGHTFUL PARTNER TO THESON OF LATE MR.FESTUS THOMAS, WHO HAS DEPOSITED THE SUM OF (US$ 6.5 MILLION DOLLAR) IN OUR BANK CUSTODY BEFORE HIS DEATH. SIR, THIS NOBLE BANK HEREBY TO LET YOU KNOW THAT THE LETTLEBOY MR. LUIS THOMAS, THESON TO LATEMR. FESTUS THOMAS, WHO IS IN THE RIGHT POSSITION TO CLAIM HIS FATHER FUND DEPOSITED IN THIS BANK FOR SAFE KEEPING. HE ALSO GRAVE TO THE INTEREST OF THIS BANK THAT YOU ARE HIS RIGHTFUL PARTNER TO RECEIVE THIS FUND IN YOUR COUNTRY. THEREFORE, WE HAVE ACKNOWLEDGE HIS RESPONSE TO WIRE TRANSFER HIS INHERITANCE FUND TO YOUR NOMINATED BANK ACCOUNT INFORMATION, MEANWHILE YOU ARE ADVICE TO GET BACK TO THIS NOBLE BANK WITH YOUR FULL BANKING INFORMATION WHERE THIS FUND WILL TRANSFER TO, THIS AUTHORITY WANT YOU TO COMFIRM YOUR FULL BANKING DETAIL'S TO THIS FOREIGN REMITTANCE DEPT. IN (24) HOURS TO AFFIRM THE TRANSFER IMMEDIATELY. MORE SO, YOU ARE HEREBY ADVICE TO PRINT OUT OUR BANK OFFICIAL APPLICATION FORM AND FILL IT PROPERLY WITH YOUR TRUST BANK ACCOUNT INFORMATION AND YOUR PERSONAL INFORMATION, FOR THE TRANSFER OF YOUR PARTNER INHERITANCE FUND IN QUESTION. IN RECEIVE OF THE ABOVE INFORMATION THIS BANK WILL WIRE TRANSFER OF HIS FUND TO YOUR ACCOUNT DESTINATION IN YOUR COUNTRY, WITH OUT ANY FURTHER DELAY. WE LOOK FORWARD TO HEAR FROM YOU URGENTLY. 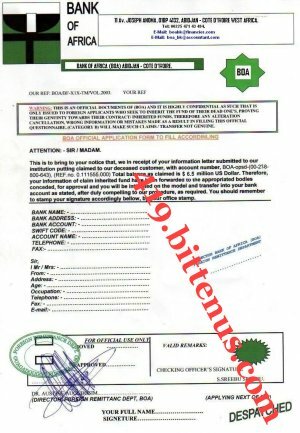 SIR IN-ADDITION YOU SHOULD SEND AMOUNT OF USD$200 DOLLAR, TO THIS FOREIGN REMITTANCE DEPARTMENT TO ENABLE THIS OFFICE SECURE THE ALLOCATION APPROVAL OF YOUR BANK ACCOUNT INFORMATION ALSO ACTIVATE IT FOR IMMEDIATE TRANSFER. BELLOW IS OUR BANK RESIDENT LAWYER INFORMATION THAT YOU WILL USE AND SEND THE MONEY THROUGH WESTERN UNION MONEY TRANSFER, AND RE-SEND THE PAYMENT INFORMATION BACK TO THIS BANK WITH THE APPLICATION FORM TO ENABLE THE TRANSFER COMMERNCE IMMEDIATELY. COUNTRY: COTE D'IVOIRE ( FORMER IVORY COAST). THANKS FOR YOUR KIND CO-OPERATIONS. DIRECTOR, FOREIGN REMITTANCE DEPT. BANK OF AFRICA (BOA) CI.